We hadn't packed for the early spring chill of Europe, so we resolved to find warmer climes. However, we felt the war limited our options. We reluctantly cancelled our tickets to Morocco and once again found ourselves forced to devise a backup plan. We batted around ideas as we sat shivering in French and Italian sidewalk cafés drinking overpriced Cokes. Where could we find a warm and friendly place? As yet another French waiter turned on his heel, sniffing at our meager tip, it became eminently clear: "We should hit the pub." 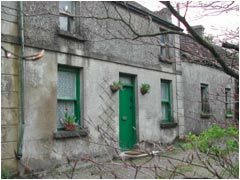 We sent some inquiries and received the reply "come for Easter dinner, the pub's open" and soon we were on a plane to Ireland. We landed in Dublin and were met by Jon Kennedy, our dear friend, groomsman and personal savior. A few years back, Will and Jon worked together in London, where the hulking Jon saved Will and his broken pelvis one fateful English night (a story for another time — over a Guinness). Jon is an Irishman based in London. However, he was back in Ireland for work, so we crashed with him at his flat on the Dublin coast. We had a fitting reunion, hitting the coastal pubs. 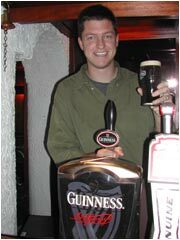 With some fanfare and a great deal of nostalgia, Will tried his first Irish-born pint of Guinness with the man who introduced him to the glorious dark and murky stuff years ago in a London pub called Filthy McNasty's. The European chill in our bones quickly melted away as we caught up on old times with good friends in front of a pub fire. We met Jon's lovely and engaging fiancé, Helen, whom he soon whisked away to Northern Ireland for a romantic pre-Easter get-away. We stayed behind to explore Dublin and promised that we'd meet up with him near Belfast later that week. Jon left us with the keys to the flat and a list of cultural must-sees in Dublin. In other words — a list of pubs. After spending six weeks marching through every French museum and Italian Duomo, a pub-crawl sounded like the just the right amount of culture. A few pints later, we had concocted a wee limerick to celebrate Will's grandparents' 60th anniversary from afar. "Kennedy's Guide to Dublin Culture" led us all over Dublin, to pubs big and small, crowded and intimate, yuppie and working class, literary and above all friendly. One pub on the list, "The Smallest Bar in Dublin," was closed for renovations. However, a knock brought the architect to the door, whose apologetic smile quickly gave way to a promising "Would you like to come in for a quick look around?" Hours later he poured us back out of the Smallest Bar, where Will had just spent the afternoon learning the fine art of pouring Guinness from the new virgin taps. Our Dublin Day went late into the evening, finishing in an out of the way pub, where we sat warm and happy in the corner, tapping our feet to fiddles, drums and pipes.